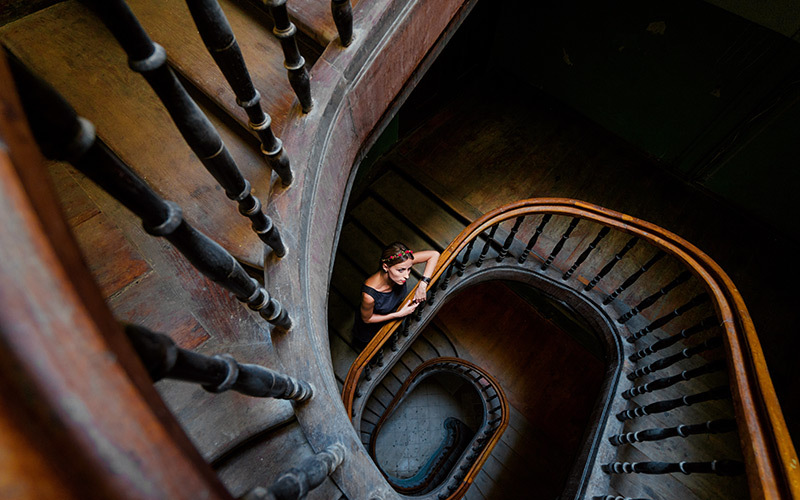 We have all been enchanted by an image of a rich, spiraling staircase, complete with an elegant woman descending to the bottom in her beautiful dress. There is something epic and charming about a well-made, classic staircase. You may believe that interesting, intricate stair designs are not for “normal” homes, but ASA Builders Supply can win your trust in this department. We’ve helped countless clients build staircases that are elegant and ornate, as well as, durable and fit for family life. Whatever your needs or wants, ASA Builders has a solution for you. Staircases are a focal point of your home, a unique mark of character and class for friends and family to enjoy. ASA Builders Supply uses L.J. Smith Stair Systems, a top-of-the-line stair parts maker and designer. Come in and consult with ASA’s experts to design your stairs, railings, and choose the proper materials. 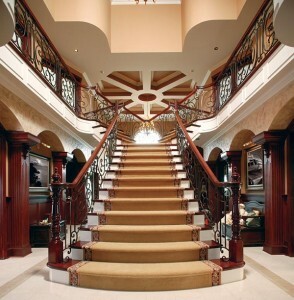 Enjoy the finer things with ASA Builders Supply staircases. Many great combinations for customer stair builders designs have a wood design having a laminate counter, a stone place having a wood staircase, or stainless like a counter inset. One other popular combination is glass being an inset for wood stairs. Whenever you install new stairs and counters, it may rapidly become a costly project. You are able to encounter difficulty identifying whether you need to start the project having a less costly material or wait some time to conserve for that material you’ve always dream of. The most crucial facet of a kitchen staircase restoration is that you’ve a kitchen space that is more functional and materials in stated kitchen space for durable and attractive. You would like your kitchen staircase design to enhance your house interior planning. It’s also wise to keep thinking about materials which increase the need for your house instead of materials that do not because that’s why is an investment well worth the cost. It’s very simple to save money than you planned when you start do it yourself projects, since you will find many great possibilities. However, you should think about the do it yourself aspects of your house along with the total budget you’ve. It’s also vital that you begin a budget in advance. If money isn’t a first concern, then make sure that your project doesn’t exceed 5 % of the need for your house, regardless of what the advance. Regardless of budget you establish, make sure to make contact with a professional for the greatest guidance home based remodels, specifically for new customer stair builders designs. With the help of professionals you are able to make sure that you understand all the available alternatives alongside the connected costs. ASA Builders has a stair system to fit any style. We offer hardwood stair parts to build a unique stairway with a rugged craftsman style, or more traditional look with Oak or Maple newels and balusters. We will help you build your stairs with a signature uniqueness and style. Stop in to see our displays and full selection. When you’re thinking about different materials for the staircase moulding designs, granite remains a well known one. This can be with discretion on existing staircase moulding when employed for your home or bathroom counter tops. Of materials utilized in bathroom and kitchen remodels, granite remains typically the most popular choice. You’ll find granite in whitened, gray, or black, which makes it a flexible backdrop for just about any redesign. Granite offers a number of depth and color due to the people deposits found in it. You can observe a good color whenever you look over the smooth surface or even the individual deposits whenever you consider the surface close up. When it comes to hot pans, granite isn’t the perfect for handling it, however, you easily keep up with the brightness and also the sheen surface by repeated cleaning. Marble will come in many tones and several shades, though, it’s a porous surface for staircase moulding designs. It’s very solid but costly and finest accustomed to accent a staircase moulding design. At a lower price costly opportunities, you should use decorative concrete with discretion on your brand-new staircase moulding with unique designs built to complement a number of surfaces. For example, when the marble finish is simply too costly, you are able to integrate decorative concrete with placed designs to look like marble. Many great combinations for staircase moulding designs have a wood design having a laminate counter, a stone place having a wood cabinet, or stainless like a counter inset. One other popular combination is glass being an inset for wood staircase moulding. Whenever you install new staircase moulding and counters, it may rapidly become an costly project. You are able to encounter difficulty identifying whether you need to start the project having a less costly material or wait some time to conserve for that material you’ve always dreamt of. The most crucial facet of a kitchen cabinet restoration is that you’ve a kitchen space that is more functional and materials in stated kitchen space for durable and attractive. You would like your kitchen cabinet design to enhance your house interior planning. It’s also wise to keep thinking about materials which increase the need for your house instead of materials that do not because that’s why is an investment well worth the cost. It’s very simple to save money than you planned when you start do it yourself projects, since you will find many great possibilities. However, you should think about the do it yourself aspects of your house along with the total budget you’ve. It’s also vital that you begin a budget in advance. If money isn’t a first concern, then make sure that your project doesn’t exceed 5 % of the need for your house, regardless of what the advance. Regardless of budget you establish, make sure to make contact with a professional for the greatest guidance home based remodels, specifically for new staircase moulding designs. With the help of professionals you are able to make sure that you understand all the available alternatives alongside the connected costs. When you’re setting up new stair shelves, you may question which wood to make use of. You will find a lot of great options as well as your decision could depend on the styles in your house, the furnishings you have, or simply a new design option you want to make use of. Regardless of your ideas, selecting stair shelves wood is created simpler by using experts who can answer any queries and provide the very best guidance. You will find professionals available to complement an ideal stair shelves wood for your new stair shelves designs, making the entire process of your brand-new stair shelves installation easy and fun. Selecting the best type of wood for stair shelves could be a confusing choice. There’s great news, though. Choosing the best type of wood doesn’t have to become a difficult process. Better still news would be that the studies have been done for you! You just find out about each kind and speak with professionals to know the choices open to you. Regardless of what type of wood stair shelves you’re perusing, it’s generally better to make certain they’re wood stair shelves. Producers frequently use particalboard instead of wood to chop costs. Regrettably, particalboard is really a wood composite that doesn’t last as lengthy as wood, and surely doesn’t look as nice. Probably the most popular forest selected for stair shelves is oak. Due to the proliferation of oak trees oak stair shelves are frequently simple to find. Furthermore, oak stains well, lasts lengthy, is durable, and appears appealing. Another option of wood for stair shelves is ponderosa pine. Ponderosa pine is available in whitened, and yellow are frequently employed for stair shelves. While pine is versatile, it may be very difficult to utilize if you are planning to stain it yourself, therefore, it may be better to leave the discoloration to professionals. An very adaptable wood, walnut is valued among stair shelves makers. It may be stained in any shade while still showing its natural wood grain. Walnut may also be more cost-effective since many walnut are available in Asia, where most pre-put together stair shelves can also be made. Probably the most costly, but additionally probably the most beautiful, cherry wood is exclusive. As cherry age range, it changes from the light wood color to some dark red-colored color with time. Natural red-colored hue of cherry wood, once it’s been stained, will boost the stain. Finally, mahogany, while rare, come with an opulent and lavish turn to them that triggers lots of home owners to fall deeply in love with them. Most home owners searching for a distinctive style and sophistication will go for mahogany, but tend to will also get exactly the same results along with other wood stained to appear like mahogany. This short article only agreed to be a short summary of the kinds of wood readily available for stair shelves. Obviously, regional variations may provide different wood types, but fundamental essentials fundamentals. Seeing a stair shelves maker or home improvement store will help you to consider the wood making an educated choice. So many people are now worried about remodeling and design materials and procedures alike for economically friendly. You with thankful to understand that cabinetry is after this movement. Regardless of what design you’re searching for, you will find options that may suit your creative and decorative desires whilst being economically friendly. You will find four available techniques for eco-friendly cabinetry, and both of them are talked about below. The very first method is dependent on renewable forest systems, licensed through the Forest Stewardship Council. Regrettably, if the organization you order your stair parts and millwork from isn’t local, the packaging and shipping of the stair parts and millwork might not be as eco-friendly while you had wished. Permanently of setting up eco-friendly stair parts and millwork is to apply stair parts and millwork built by agrifiber. Agrifiber-based cabinetry uses a mix of wood along with other farming (wheat, corn, etc.) materials to create stair parts and millwork. Another method is by using a cabinet maker that produces their stair parts and millwork exclusively from recycled materials. These materials ranges from recycled wood from paper processing plants to recycled metals from junked cars. As the stair parts and millwork created by KCMA-ESP companies might not continually be considered eco-friendly (if made from wood), the techniques of KCMA-ESP people are increasingly being covered by Leader Barack Obama’s 2011 Energy Initiative programs. These programs help recognize energy efficiency initiatives in industries which were formerly high-finish energy customers. Additionally they offer grant and home loan programs to rural companies that desire to upgrade to more energy-efficient equipment. Again, as the wood itself might not be a “green” product, the manufacturing from the cabinet is every bit, otherwise much more, essential in its utilization of energy and participation within the eco-friendly movement. So, in case your goal would be to redesign or build using just as much eco-friendly material as you possibly can, look at firms that are people of KCMA-ESP. These businesses are devoted to eco seem production practices whilst creating quality finish items. Also, many of these companies produce their finish items using recycled material that’s top quality and delightful. For additional info on finding cabinet makers owed to KCMA-ESP. There’s enough detailed information online there, including suppliers such as the following the practices needed to become a person in the association. Among the efficient ways to add color for your wood stair moulding would be to stain them. Discoloration also maintains the good thing about the wood’s natural grain. Producers use different names for various stains, so be cautious in choosing your stain…the same title may well be a different color for an additional company. Choose the wood you want, after which think about the final look you would like, then it will likely be simpler to determine if your light, medium, or dark stain works best using the wood you’ve selected. Bear in mind that simply getting a stain won’t safeguard your wood. A finishing coat must be relevant to the stain to be able to safeguard the wood. You are able to choose just how much shine you need just like you’d choose fresh paint colors: matte, high-gloss, or perhaps in-between. From blue to red-colored, fresh paint has got the terrific quality of permitting an array of colors to choose from. Additionally, fresh paint enables the applier to use any selection of effects including sponging, spackle, and marbling. Also, fresh paint can provide an even finish, glossy finish, and just about anything among. However, you should keep in mind that, because the wood contracts, fresh paint will call focus on any hairline cracks that become uncovered. Preparation for fresh paint can include extensive sanding, particularly if stair moulding are older and previous fresh paint continues to be applied. This may also be essential to replace colored-over hardware. Lastly, a protective topcoat might need to get offers for to safeguard the fresh paint from kitchen greases and smoke when the stair moulding is situated in the kitchen area. Among the more recent finishes for stair moulding is polyester. Obtainable in glossy and matter finishes, polyester benefits stair moulding exactly the same way it benefits cars: sturdiness and quality. Polyester finishes can also add extra protection and quality for your stair moulding whilst adding exceptional design using its protection. Polyester includes a more solid look than discomfort since it also fills within the pores from the wood however, preparation from the wood, including sanding and finishing, is completely necessary. Additionally, a unique topcoat should be applied. Due to the quantity of work that adopts the preparation and finishing of polyester, it’s frequently one of the most costly choices for finishing stair moulding. There are many ways to select custom stair parts. One of the most popular durable materials in customer stair parts is PVC. This really is built from wood materials and it is then engrossed in a thin sheet of PVC. The PVC is allegedly harder than melamine and laminated flooring. You will find very couple of color and finished options with PVC designs, but it’s a pleasant alternative for individuals who’re with limited funds. Lately, glass grew to become a well-known custom stair parts staircase design options due to the brightness it brings into any area. Glass will reflect sunlight or synthetic light and therefore can produce a small room look and feel bigger. With glass shelves inside your kitchen or bathroom stairs, you will discover endless programs. You are able to integrate glass because the shelves inside your kitchen or bathroom stairs, or as inlaid home windows or sections around the staircase doorways. This may bring by using it the down-side of subjecting all the items in your stairs, unless of course you employ a frosted or colored glass option. With beveled glass you can include new dimensions for your staircase doorways. For modern or oriental custom stair parts designs you should use laquered stairs. These provide a smooth sheen for just about any custom stair parts designs with a number of color and finished options. However laquered products are vulnerable to chipping and discoloration with time. Many homes presently will express a brand new style through stainless for custom stair parts designs. Because of today’s technology you will find now a number of stainless designs for any kitchen and stairs. Stainless provides more flexibility than wood since it is not impacted by temps or by condensation. Many of the helpful in kitchen areas those are vulnerable to rapid fluctuations both in. Stainless is progressively popular when built-into wood kitchen areas and laminated kitchen areas. For stainless stairs, it’s typical to use the stainless over an MDF base. This can provide your home or bathroom staircase designs with increased substance. Of materials, stainless may be the easiest to wash. It’ll show any and each mark, particularly finger marks, easily, but is tough to scratch. Another special materials for custom stair parts designs is copper. This can be a warmer metal while offering a pleasant variety for kitchen areas that have granite counter tops. It’s best used being an accent for the kitchen. When you’re thinking about different materials for the custom stair parts designs, granite remains a well known one. This can be with discretion on existing stairs when employed for your home or bathroom counter tops. Of materials utilized in custom stair parts remodels, granite remains typically the most popular choice. You’ll find granite in whitened, gray, or black, which makes it a flexible backdrop for just about any redesign.